Japanese parliament passes Offshore Wind legislation. The Japanese government has enacted legislation to encourage the development of new offshore wind projects. This legislation is introduced at a time when Europe is seeing a surge in offshore wind development with tariffs continuing to reduce and Taiwan has led the way in the region by establishing a framework for delivery of offshore wind facilities that has allowed one project to achieve financial close with more anticipated to follow. The new law will create a much needed national framework to co-ordinate efforts to establish an offshore wind industry in Japan. In this article we examine some of the key features of the new legislation and consider some of the remaining concerns that sponsors, contractors and funders may have. On 30 November 2018, the Japanese parliament approved the Act for the Promotion of Use of Marine Areas for Development of Marine Renewable Energy Generation Facilities (the Act) to introduce a new national framework for offshore wind projects in Japan. The framework is long awaited by industry participants, both international and domestic, who have struggled to develop large offshore wind projects. Notwithstanding the high feed-in tariffs that have been offered by the government under the current regime, a number of factors have stifled the development of commercial offshore wind facilities in Japan to date. indicating the process by which tenderers will be able to compete to secure occupancy rights for offshore wind projects. whether the facility would adversely affect the fishery activity around the zone. At this stage, no details have been provided as to where these Promotion Zones are likely to be located or indeed as to the timing of when the decision will be made. However a number of developers are nonetheless pressing ahead with early phase development work such as environmental impact assessments in anticipation of where Promotion Zones might be established. Set out below is a chart from the Agency for Natural Resources and Energy1 showing the projects undergoing EIAs as of August last year. The Act provides that the maximum occupancy period of a Promotion Zone is 30 years, which is a welcome change from the short term occupancy rights granted by local prefectures prior to the introduction of the Act. From a bankability perspective, longer term occupancy rights facilitate long-term revenues to service project debt. Equally from a localisation perspective, long-term occupancy provides greater opportunities for the development of localised operation and maintenance hubs to provide O&M and other support services to operational wind farms, offering the scope to develop locally based skilled labour. Developers will be invited to place competitive bids for the right to develop such Promotion Zones through a public tender process. In theory, there is no limit on the participation of international developers in this process and 100% foreign ownership will be permitted. However, during the discussion of the Act in Parliament, it was noted that "the selected operator is not required to be a domestic (Japanese) entity, however, the opinions of local stakeholders and the selected generator's ability to respond to emergency situations should be evaluated". Developers will have to compete not just on tariff, but also on the suitability of their occupancy plans. The tariff process is therefore different from the approach otherwise adopted for the existing Japanese feed-in tariff scheme, whereby the tariff price and period is set by METI under the Act on Special Measures Concerning the Procurement of Electricity from Renewable Energy Sources by Electricity Utilities (the "Renewable Energy Act"). other matters regarding the implementation of the tender offer. At this stage, the details of the evaluation criteria are not clear, but they are likely to include the feasibility, long-term stability, efficiency and proposed tariff of the project. In any event it is clear that evaluation will not be on tariff alone. In terms of tariff expectations, METI is targeting a price in the range of JPY 8-9/kWh by 2030 for fixed offshore wind. While this is comparable with the prices being achieved by offshore wind in Europe for projects entering commercial operation in the early 2020's, it should be noted that Japan is at the very beginning of developing a supply chain to deliver offshore wind, whereas that supply chain has existed in Europe for some time. Another interesting factor is the development of floating offshore wind which is likely to take place at a faster rate in Asia than it has done in Europe and for which there is no meaningful European comparative price. While some in the industry would like to see initial tariffs for fixed offshore wind close to the current feed-in tariff of JPY 36/kWh, the Government is no doubt conscious of the feed-in tariff surcharge being levied on industrials and consumers which for 2017 has grown to 11% of the cost of electricity for consumers and 16% for industrials and the need to balance these growing surcharge costs with incentivising developers to make the investment here in Japan2. While the approval of the Act is a promising development, we note that there are a number of key issues which potential developers, contractors and funders will likely wish to take into account in their bankability assessment of an offshore wind project carried out under the Act. Certainty of occupancy rights: The Council will engage with relevant stakeholders when determining the Promotion Zones and one of the functions of the Act is to establish a mechanism for this interaction. However, the occupancy rights granted are not equivalent to a leasehold which would provide exclusive occupation rights. The process of stakeholder engagement would not appear to prevent third parties from potentially later asserting rights to use the marine area in a designated Promotion Zone in a manner that could be adverse to the windfarm. Security interests: Security interests cannot be established over the occupancy rights (unlike standard leasehold rights) since they are permits granted by government authorities. However we would note that similar issues regarding an inability to take security over offshore leasehold rights have been encountered in UK projects where security cannot be perfected because the project is beyond the 12 mile UK territorial limit. Environmental approvals: The Act does not address one of the largest existing issues in relation to offshore wind in Japan. The lengthy environmental approvals process has caused delays to the commencement of construction of wind projects. Environmental approvals for offshore wind projects have been known to take up to 7 years to complete and so improvement of this process will be integral for developer certainty for participation in the industry. The Act provides that METI and MLIT are required, when they designate Promotion Zones, to consult with the Minister of Environment (MoE) and Minister of Agriculture, Forestry and Fisheries (MAFF). It is hoped that the overall co-ordination function of the Council when it establishes the Promotion Zones will help smooth the environmental approval process. However, the environmental impact approval process itself is required to be resolved separately outside of the Council consultation process. Curtailment: The ability of grid operators and utilities to curtail the output of renewable energy onto the grid is a risk that needs serious consideration as countries increase their use of renewables. 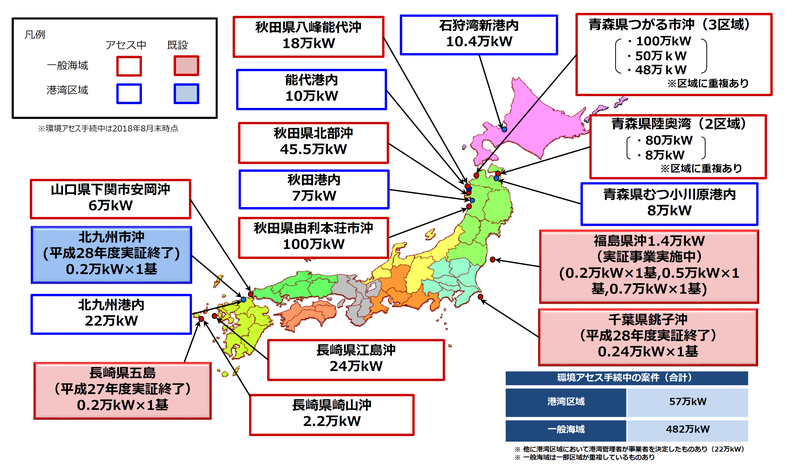 In Japan, the various utilities have the right to curtail the output of a generator onto the grid and indeed there have been various reported instances of utilities exercising this curtailment right in relation to solar facilities. In most cases there is usually a limit in terms of the number of days or hours of curtailment per annum before the utility must pay compensation. Curtailment is a risk that will need to be considered on a case by case basis having regard to the location of the proposed offshore windfarm. Power offtake: Offtake arrangements are left to be negotiated separately with the relevant local utility. We expect that power purchase agreements (PPAs) for offshore wind projects will largely follow the same form adopted for solar projects in Japan. Each utility has its own form of PPA but these are normally largely based on METI's form. These PPAs have a 20 year term from commencement of operations and the utility must take the output of the facility with limited exceptions (including the curtailment right described above). While these PPAs have proved adequate for the purposes of relatively small-scale solar and onshore wind, their bankability has yet to be tested in the context of a large-scale offshore wind financing. We would however note that the often criticised form of PPA in Taiwan has apparently been successfully banked for Formosa 1. The introduction of the Act is a promising first step, but the market is keenly awaiting the next developments. On the one hand, developers are keen to see the secondary legislation that will flesh out matters such as the auction process. But they also want to know more about the location of the proposed Promotion Zones. METI’s documents released with the bill for this Act last March indicated that the Japanese government intends to designate five Promotion Zones for development by FY2030. There are currently no details about the location of these zones, their size or whether the number of zones may be increased in the future. There therefore remains a significant task ahead to put in place the necessary framework to enable Japan to achieve its targets for offshore wind. 2019 looks to be a pivotal year in determining how successful Japan is likely to be in reaching its goals and how quickly it can achieve them. 2 Data sourced from a METI presentation on renewable energy policy at the 5th Asia Offshore Wind Conference in Tokyo on 24 January 2019.